Race riots struck New Haven, Boston, and Pittsburgh in the mid-1820s. Throughout the decade groups of harassing lower-class whites in New York City periodically disrupted African-American theater performances. In 1829, white mobs in Cincinnati used unprecedented terror and destruction to force perhaps several hundred African Americans to seek refuge in Canada, and in November of that year, Philadelphia underwent its first major race riot. And finally . . . contention spread southward in 1831 to Virginia in the wake of Nat Turner’s rebellion. In 1831 two short stories appeared anonymously; concerned by the increase in racial animosities, their author conveyed “the abolitionists’ apocalyptic premonition that stark alternatives awaited the nation as the 1830s opened—race war or interracial ‘amalgamation.’” * Both stories appeared with the byline “T. T.” in two issues of The Liberator, the weekly newspaper founded at the beginning of the year by the Boston abolitionist William Lloyd Garrison. In one, the narrator wakes up in a world following a race war, where black forces have won and Congress is meeting to decide what to do with the remaining whites—enslave them, send them back to Europe, or kill them all. The other story is at the opposite end of the spectrum: Slavery has ended, equality has been achieved, and into the room walks the first black president. Notes: The epigraph opening the story loosely translates a line from Cicero’s The Nature of the Gods and was used by Samuel Johnson in his serial publication The Rambler (1751). On page 295, the “new” place names—Lundy Place, Benezet Street, Granville Street—are meant to serve as fictional tributes to antislavery advocates Benjamin Lundy, Anthony Benezet, and Granville Sharp. Subsequent references to monuments and localities honor British abolitionists James Stephen, William Wilberforce, and Thomas Clarkson. * James Brewer Stewart, ”The Emergence of Racial Modernity and the Rise of the White North, 1790–1840,” Journal of the Early Republic (Summer 1998), pp. 181–217. I was reading, the other day, some very curious reasonings upon time, which, as well as space, the author annihilates without any ceremony. ‘I have proved elsewhere,’ says he, ‘that the idea of duration offers nothing absolute. . . . If you don't see the full selection below, click here (PDF) or click here (Google Docs) to read it—free! An anonymous story, an anonymous comment, and an enormous disappointment. If the editors insist on pulling literatrure from the day's headlines, I would prefer something like Martin Luther King's "I have a dream" speech. I have never seen the full text of that. The preceding off-the-wall responses, resulting in a private conversation, are deplorably socially clueless in a too-familiar Internet way that I'd like not to find when I click on Comments under a Library of America story that I have just read with appreciation for the thought that went into selecting it for us. I suubmitted the previous post & I want to clarify that the rudeness I referred to was not LOA's but the original commenter's. Forgive me for seeming to include LOA. LOA is great about replying. Unlike Bob, I am glad that The Library of America is mixing items of extraordinary historical interest with selections from American literary history. And--wow--this is a fascinating, prophetic document of serious historical worth in so many ways. 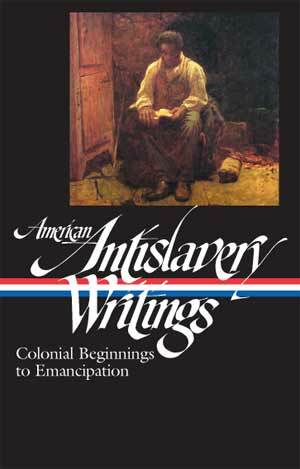 The most peculiar part of Bob’s comment is the statement that this selection is “pulled from today’s headlines.” I suppose this refers to Obama’s inauguration, but there is whole lot more to this selection, written nearly two centuries ago: Abolitionism. The Emancipation Proclamation. Anti-miscegenation laws. Civil rights. And the election of an American president. These are not tabloid filler, but timeless historical matters.